You'd be hard pressed these days to find two bigger movie franchises that Star Wars and the Marvel Cinematic Universe, both of which have been raking in massive box office receipts. Star Wars: The Force Awakens has taken in a record-breaking $936.3 million domestically and $2.06 billion worldwide, while Marvel launched the first movie in their Phase 3 lineup last weekend, Captain America: Civil War, which earned a whopping $179.1 million in its debut. While both of these franchises have much in common, aside from the fact that they're both housed at Disney, one Instagram user made quite the startling discovery. Instagram user Morphy_Me used his considerable Photoshop skills to take a photo of Captain America: Civil War star Sebastian Stan, and by just changing his hair and costume, turned him into a young Luke Skywalker (Mark Hamill) from the original trilogy. Another Twitter user found the original Luke Skywalker image this photoshopped version is based on, and presented them both side-by-side. The resemblance is certainly uncanny, which may lead some to wonder about whether or not Sebastian Stan could actually come aboard the Star Wars franchise and play a young Luke Skywalker. Of course, as of now, Disney and LucasFilm haven't confirmed any sort of Luke Skywalker spinoff movie, and, as far as we know, this iconic character won't be featured in the first spinoff, Rogue One, or the Han Solo movie. The Han Solo spinoff will provide an origin story for the rogue smuggler, long before he's introduced in the Mos Eisley Cantina in Star Wars: Episode IV - A New Hope. Still, with the Star Wars franchise more popular than ever, the possibilities are certainly endless. There doesn't seem to be any end in sight for the Marvel Cinematic Universe either, with the studio's 10-movie Phase 3 lineup already set through the year 2019, with Avengers: Infinity War - Part II arriving on May 3, 2019. The studio has also set three dates for unspecified movies on May 1, 2020, July 10, 2020 and November 6, 2020, but the studio hasn't announced what movies will fill those slots. 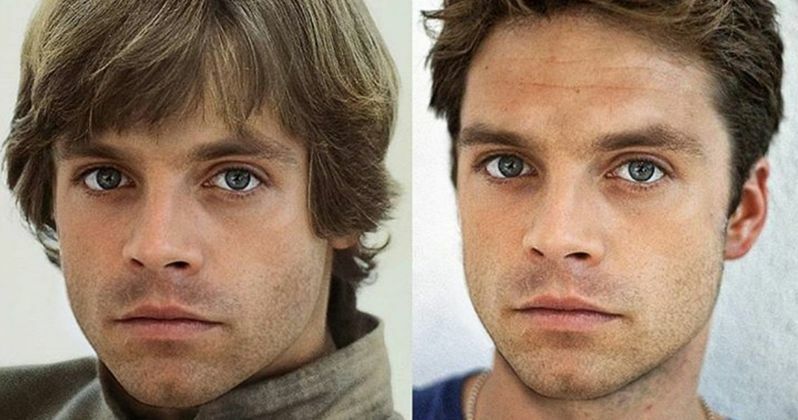 Take a look at these uncanny photos below, and let us know what you think about Sebastian Stan being turned into a young Luke Skywalker.